With school and office shootings still fresh on the minds and hearts of parents and school officials, districts, institutions and offices continue to look for ways to better protect staff, students and teachers, alert authorities quicker and more effectively, and improve overall communications – especially in a lockdown, active threat or other emergency situation. 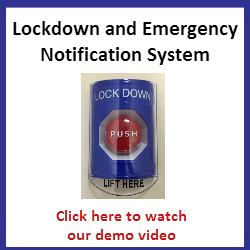 Through our close work with over 100 schools and libraries, and over 1,000 businesses, we have developed a comprehensive notification system that fully addresses what a school district or office needs in the case of a lockdown event. Watch a demo of our system! The automatic NJ school safety solution is a flexible system that ties into several different technologies. It can grow and expand to work with existing infrastructure, and meet the challenging demands of today’s school budgets. Our recommended solution harnesses the power of a ShoreTel telephone within each classroom or office, utilizing the special capabilities for handling emergency situations, the building-wide paging system, special “screen pops” on computer screens, and a wireless notification system with strobe lights, LED signs, speakers, and prerecorded messages. It also includes options for providing a signal to perimeter control systems for doors and other building access points, as well as the ability for authorities to page into the school using a cell phone. The office and school safety system will also allow initiation of a “Shelter in Place” and “Building Evacuation” alert for when those procedures need to be put in place.